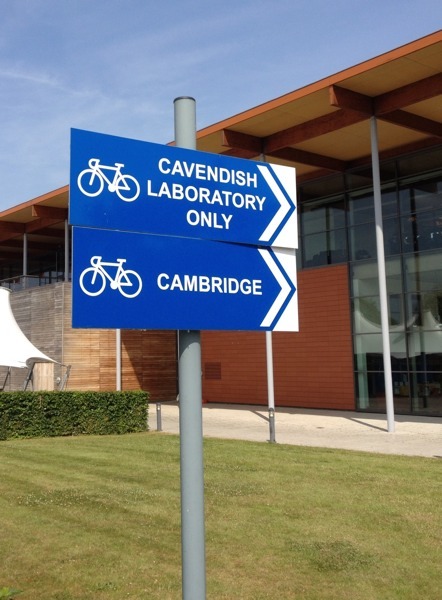 I think this indicates that all of Cambridge is now part of the Cavendish Lab. I know they’ve been expanding a lot recently, but I didn’t realise they’d got that far. On the other hand, I may be confused. It’s difficult to keep a clear head when you’re cycling backwards like that. I assume it means that the next turn on the right is for the Cavendish Labs, and the one immediately thereafter is to get to Cambridge…town centre? As for riding backwards, well…maybe they lost the stencil with the bike the other way around! Yes, you might think that, mightn’t you? But in fact, if you take this right turn, after a hundred yards or so, it splits again – Cavendish Laboratory Only to the right, and Cambridge straight ahead.